Well, who would have thought it? An idea to retire to Sunny Spain and escape the rat race in the UK, results in me, my hubby and mother, (rope in my brother frequently) working harder than ever in dog rescue. How did that happen? After moving to Spain in 2004 and struggling to learn Spanish, I thought if I volunteered at my local dog shelter it would improve my Spanish. Only to find the shelter was run by Brits and Dutch ladies — lol. I spent a happy couple of years shoveling poo and playing with the dogs once a week which then crept to twice a week and fostering the odd dog along the way. Suddenly I'm fostering mainly Podencos and the then shelter manager Valerie had the foresight to start pushing Podencos and Galgos for homing in the UK. In the good old days, it was done through chatting on forums ( no Facebook then). Hence Ibizan Hound Rescue was born; people had never heard of the breed Podenco so it was never considered as part of the charity name! When Valerie returned to the UK, the charity spread its wings and we went solo in Spain rescuing mainly Podencos and gave our home over to the dogs. Almost all our dogs live in the house with us (gets a bit hectic at times). Valerie got the boring bit of chatting to people, emailing and home checking all potential adoptees. Admin is not my strong point. Time and our cause progressed. Along with acquiring charity status, our home is now classed as a shelter complete with quarantine kennels for new dogs. After the quarantine period, we all live together in the house, which causes raised eye brows and smiles when we get inspected! Ibizan Hound Rescue is now 8 years young and going strong with a new team of Nina and Dawn in the UK sorting all our homing which is normally straight to new family. loads of checking and chatting is required. (We would be lost with out them). We are grateful to friends/rescues in the U.S., Czech Republic, Sweden and Denmark — all homing our dogs to loving homes. 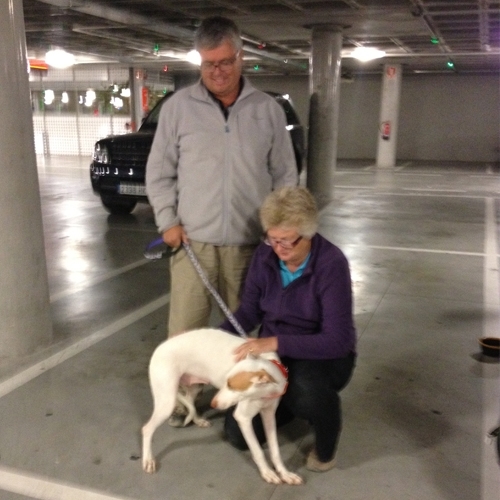 In addition to Diane, her husband Brian Hughes is integral to IHR and responsible for more trips to the airport in Madrid with multiple dogs than he cares to count. Diane's brother David is also a greatly valued participant. And, Diane and David's mum, Kaye has sacrificed any hope of un-chewed furniture and shares her bedroom with many of the rescues who need a little special closeness. Lots of bowl washing going!